Let’s face it. 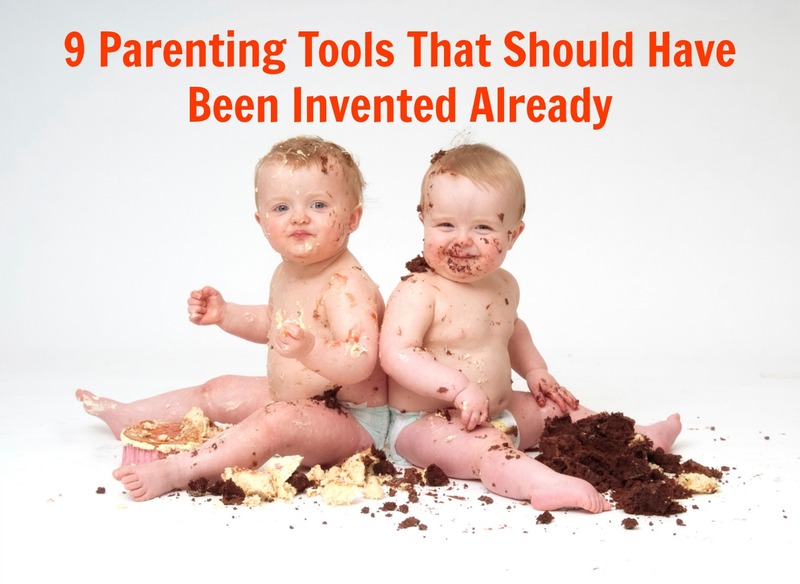 Parents have more stuff than ever to make their lives easier. Shoot, my blog helps introduce many products that do just that, but there are still some common sense items that must be invented…soon! I have three kids and don't know why these things aren’t in every baby store in America. Sure some of this stuff might be as likely as hoverboards to come along soon, or it might not pass all the safety tests, but it would restore sanity to busy parent’s lives. Something must be done, so here is my list. Borrow it, steal it, share it, whatever you do just invent one thing off here and you will go down in parenting folklore as a hero. How many times have you left the house with spit up, food, or saliva stains on your shoulder?! C'mon fashion designers can't we make some baby proof teflon fabric already? I now judge the cleanliness of my shirts just based on the collection of spots on the shoulders. Something must be done! We can put a man on the moon but we can't trap poop in a diaper? I feel as though there is a hidden tunnel that is there specifically to channel poop up my baby’s back. How do babies pull of the trick of getting it up to their armpits without much actually landing inside the diaper anyway? Sure, your kid looks cute but transfer them to solid food and you might need a hose in the nursery to wash that crib down. Accomplish this diaper feat and you will make millions. There have been points in time when I have looked longingly at duct tape and thought it would solve all of my pacifier problems. Can’t we have just a little nontoxic pacifier glue? I know, I know, there are all kinds of problems with this but an exhausted parent can dream right? Another no brainer. Onesies with snaps were designed by the devil himself. They should be illegal in all 50 states. I think being a zipper and Velcro only country would stop half of all parent meltdowns. Point me in the direction of the store that sells these first and I will spend whatever it takes. They could even have a “Snaps Onesie” exchange program where you can trade in your vile snaps for the ease of Velcro. I might just cry tears of joy instead of tears of frustration. Engineers can design bulletproof vests but it’s impossible to make jeans that make it through an afternoon of my son at the playground? I firmly believe that we can upgrade our pants technology after keeping it status quo for hundreds of years. Sure there are more pressing issues in the world, but we all know little kids should grow out of their clothes before wearing them out. Kid proof pants knees, I want them by Christmas. What do you do when your child is too old for the booster seat but is allergic to actually sitting down at dinner? I've mentioned this before in my other column on kids and dinnertime but it’s too important not to talk about here. It’s like it is physically impossible for them to stay seated for longer than 3 bites of food. The dinnertime seat belt saves meals and lives! How many arguments have you been in the middle of and you just needed a short breather? Exactly. Saved By The Bell was ahead of its time when it introduced Zach Morris calling “timeout” in the middle of a scene. Parents need this ability. Think about it. Everything freezes and you go eat a bowl of ice cream, then go back and solve the fight over what kid gets what book. You might even be able to finish cleaning the house before the first room you cleaned gets messed up again. We can dream can't we? As a dad, there is not much that brightens my day more than my son coming over and giving me a big hug. Why not get that feeling all day long? I don't know how to do it but bottle toddler hugs and they would fly off the shelf. The world would just be a better place. This list is great, thanks for the post and making me laugh! Now I can't stop picturing my daughter drinking from a giant hamster bottle in her crib and I would really love a Zach Morris "timeout"! Oh, let me know when #9 gets invented!!! Thanks for reading and yes I have been picturing this over my sons bunk bed!